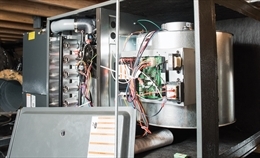 A two-stage furnace has two speeds for burners unlike a single stage furnace that operates at one fixed speed. These two speeds can be classified as low output at 68% and high output at 100 %. This is appropriate for milder months. This speed level serves for more than half of the time of the year, during which a furnace is in operation. The furnace runs slowly for longer and distributes the heat equally in the house. It is also easier for your pockets. When the temperature outside reaches the freezing point or lower, the low output mode becomes insufficient. The burners will cycle fast to produce more heat and that too quickly. Having to stage furnace is like buying two furnaces for the price of one. These units spare you the hassle of adjusting the thermostat continuously. •	Running at lower speed, the furnace runs longer. It is better able to distribute the heat. You will rarely experience temperature swings with these. •	A two stage furnace offers quite operation. As it runs at a lower speed most of the time, operational sounds are mitigated. A single stage furnace runs at one fixed and full speed all the time. It continuously cycles on and off. This cause a continuous sound. •	As it runs at lower speed at most times, it consumes less of fuel compared to single stage furnace. •	Running at a lower speed also increase the efficacy of the air filters. They are able to capture more contaminants than otherwise.